(SAN ANTONIO, Texas)—Texas Farm Bureau (TFB) voting delegates opposed concepts such as high speed rail and the acquiring of additional farm and ranch lands through eminent domain for its construction at the 83rd annual meeting of the organization. 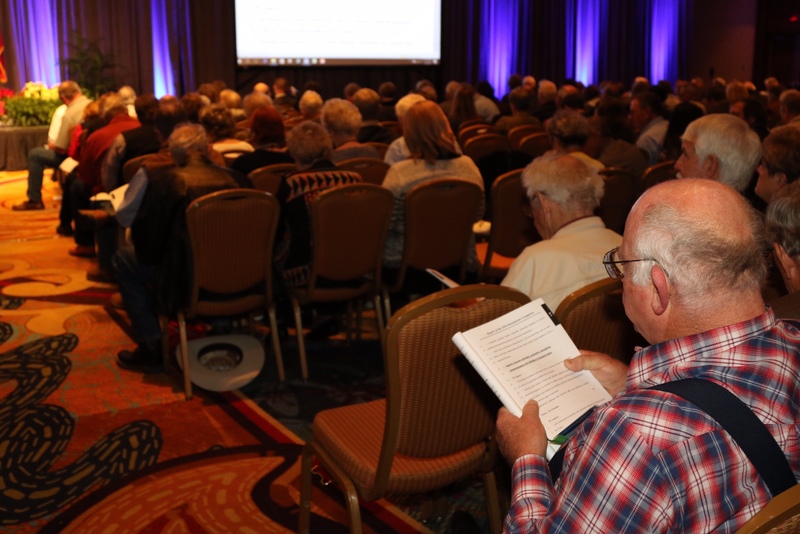 More than 900 voting delegates from county Farm Bureaus across Texas adopted state policy for the coming year and recommended national policy positions for consideration by the American Farm Bureau Federation. Private property rights, the right to repair agricultural equipment and agricultural liens were also among the policy concerns addressed during the business session, which concluded this afternoon in San Antonio. Delegates said the additional division of Texas farms, ranches and rural communities by projects such as high speed rail would put undue burdens on the rural economies. These burdens include the additional cost and time related to moving equipment and animals from one side of a farm or ranch to another, the lack of adequate exits to small Texas towns and their economies and the additional tax burden passed on to local taxpayers for projects removed from the tax base. Delegates approved a list of tenets if the high speed rail is approved and given eminent domain authority, including that it must pay for land and damages. "Texas farmers and ranchers are working hard right now to survive a slowing farm economy and low market prices," TFB President Russell Boening said. "I'm proud of how Texas Farm Bureau members continue to be vigilant in addressing important state and national policy issues that impact agriculture. It's critical that Texas farmers and ranchers remain engaged and advocate for their interests." In other policy action, delegates supported farmers having first lien on their commodity stored in a licensed and bonded warehouse—whether in open storage (farmer-owned) or contracted to be purchased when the farmer has not yet been paid. Delegates supported reducing the years of rollback tax penalty assessed on property that does not change ownership from five years to three years, or less. Delegates also supported no waiting period for property to qualify for agricultural valuation when it is taken out of agricultural use and then returned to agricultural use. Repairing technologically-advanced agricultural equipment was also discussed. Delegates supported the right of the equipment owner to repair the machine or have an independent repair facility to do so. The delegates also proposed support for an exemption to the Digital Millennium Copyright Act for the repair of agricultural vehicles. Delegates supported the research, licensed cultivation, production, processing, commercialization and use of industrial hemp. Delegates also supported Texas developing a comprehensive, multi-agency plan to fight the growing number of feral hogs in the state. During the policy session, delegates supported programs to educate and engage the public on genetically modified organisms (GMOs) and the positive effects of the technology on their lives. Texas Lieutenant Governor Dan Patrick also addressed TFB delegates and outlined legislative opportunities and challenges in the 2017 session of the Texas Legislature. He said money will be tight in the development and passage of a state two-year budget. "You are a small group of people who work really, really hard for the rest of us," Patrick said. Reelected to two-year terms to represent the state’s largest farm and ranch organization were Dan Smith of Floyd County, District 2; Ben Wible of Grayson County, District 4; Val Stephens of Dawson County, District 6; Neil Walter of Coryell County, District 8; Ronnie Muennink of Medina County, District 10; and Zack Yanta of Karnes County, District 12. Michael White of Wilbarger County, District 3, was reelected vice president and Robert Gordon of Dallam County, District 1, was reelected secretary-treasurer. 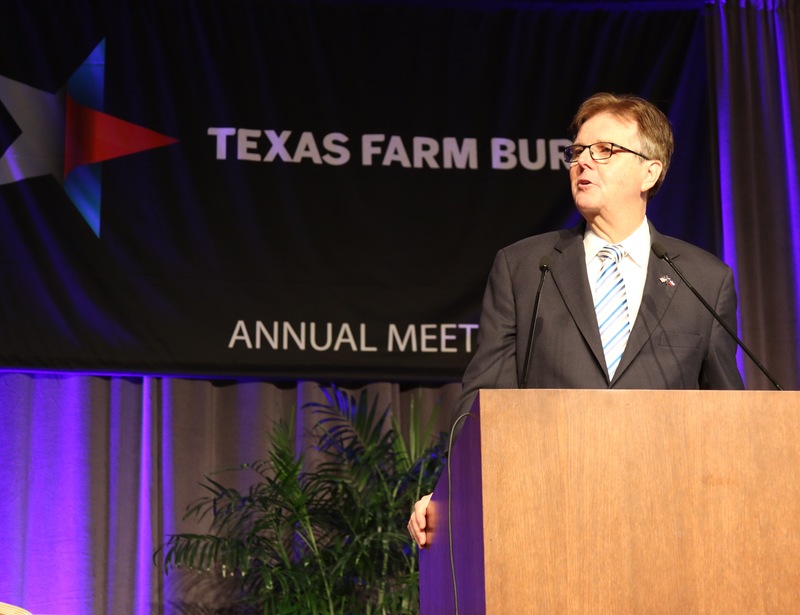 Texas Lieutenant Governor Dan Patrick offers Texas Farm Bureau members a preview of the upcoming Texas legislative session. More than 900 Texas Farm Bureau voting delegates considered state and national policy resolutions at the organization’s 83rd annual meeting in San Antonio.